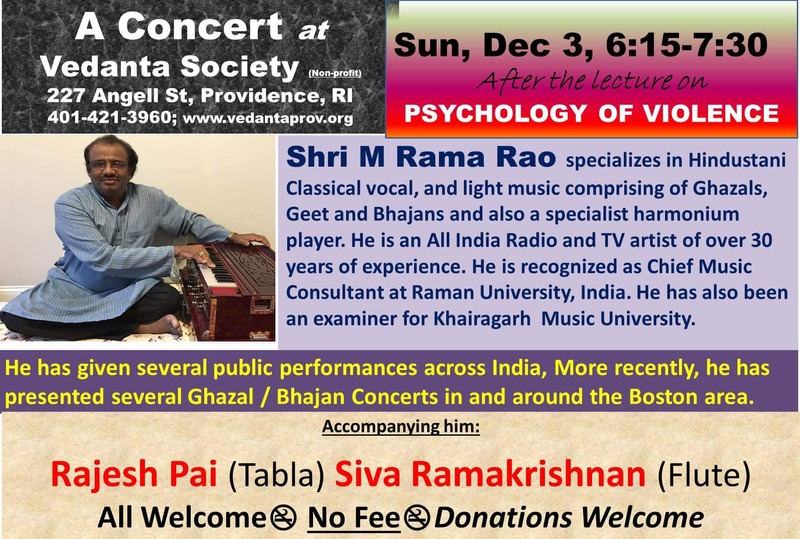 Shri M. Rama Rao will perform with Rajesh Pai (Tabla) and Siva Ramakrishnan (Flute). All are welcome. No fee, donations accepted. Click here to see poster. All children ages five (5) through twelve (12) are welcome to the Just Kids! time from 4PM – 6PM on Sun. Dec. 03. Activities conducted under the guidance of D. Abram and Chet B. The birth anniversary of Swami Premananda, a direct disciple of Sri Ramakrishna, was observed on Tues. Nov. 28 in the morning with a chant and in the evening with a song, and short biography reading. Friday’s study took up Swami Vivekananda’s second lecture in New York on “The Cosmos: The Microcosm.” A microcosm is more powerful, pervasive, and capable of governance than the macrocosm, since causes are more pervasive than effects. In the last class, we discussed how sense perceptions are generated by the organ of vision, the real organ of perception (i.e. the nerve center in the brain), the mind, the intellect, and the conscious entity (or Self) working in conjunction with one another. The light of the Self is self-luminous, and by it everything is seen. The mind is not self-luminous. It is not that the soul knows, it is knowledge itself. It is not that the soul has existence, it is existence itself. By the light of the soul, the subtle body and gross body seem to exist, but it is a borrowed existence. Similarly, the “existence” of all created things is a borrowed existence. Here, a question may arise: if the existence of all created things is a borrowed existence, why do we consider the Self to be self-luminous? The Self could have borrowed its existence from something, too. But at that point, it would go on infinitely. According to Vedanta, the Self is existence itself and is the basis of the seeming-existence of all created things. Thanksgiving evokes the spirit of thankfulness. We should be thankful to the source from whom we receive something. The great cause and ultimate source of everything that one gets, is God. Feeling grateful connects us to the Lord. Meister Eckhart said that if the only prayer we say is Thank You, that would be sufficient. Life is governed more by what we feel than by what we think. The Attribute-less Divine who is everywhere cannot shower grace on us because He is everywhere, so we impart attributes to the Divine. In the Rig Veda, Hiraṇyagarbha (literally the Golden Egg), is known as the ‘I’ identified with subtle body of the universe, connected to us as the giver of all we need. All others give as manifestations of Hiraṇyagarbha. We evolve lifetime after lifetime into bodies suitable for what we need and desire. An object of desire gives rise to another object of desire, leading to human evolution. Swami Vivekananda compared desire to the thousand-hooded snake tamed by Lord Krishna. The snake said it had only poison to offer. We need to offer the dearest thing we have to the Lord, as Abraham offered Isaac. Everything comes to us from God, through whatever means, and Thank You should be offered to God. Even if we receive something negative, it could be helpful in our own evolution. The specialty of this biography is that the author has primarily focused on the mental attitude of Sri Ramakrishna and in that light described the life events. This helps the reader in understanding Sri Ramakrishna’s personality as well as His teachings. Study of Sri Ramakrishna’s life can be best started by understanding him as a Guru. Divine Mother commanded him to remain in Bhavamukha. It is very difficult to translate this word and it is not even found in any Vedanta texts. It’s an exalted spiritual state where the aspirant keeps his mind on the borderline of the Absolute and the Relative. This allows him to contemplate on the attribute-less Brahman as well as participate in the relative world, seeing it as a manifestation of the God alone. This entire universe is made up of the various combinations of the three basic elements namely – Sattva, Rajas and Tamas. Sattva represents calmness, bliss and tranquility, Rajas represents intense activity propelled by the desires and Tamas represents callousness and absence of discriminating power. Even though they are different in nature, all these elements are originated from God alone. God is in them but they do not affect His nature. For the betterment of the humanity God comes as an incarnation to teach and to lead human beings into spirituality. The incarnation may appear as an ordinary human being. If we get deluded by the human garb of the divine, then we will miss the divine aspect and their teachings. As we try to understand the meaning of their simple teaching, it purifies our minds. When the same teaching is followed with the purified understanding, even deeper meaning is revealed and the process of purification and understanding continues.